The Lodge is a high quality, 5 Star, non-smoking and pet free self-catering holiday cottage, sleeping 4 in two bedrooms. Situated halfway between St David's and Fishguard on the outskirts of the hamlet of Llanrhian on the St. David's Peninsula in Pembrokeshire. 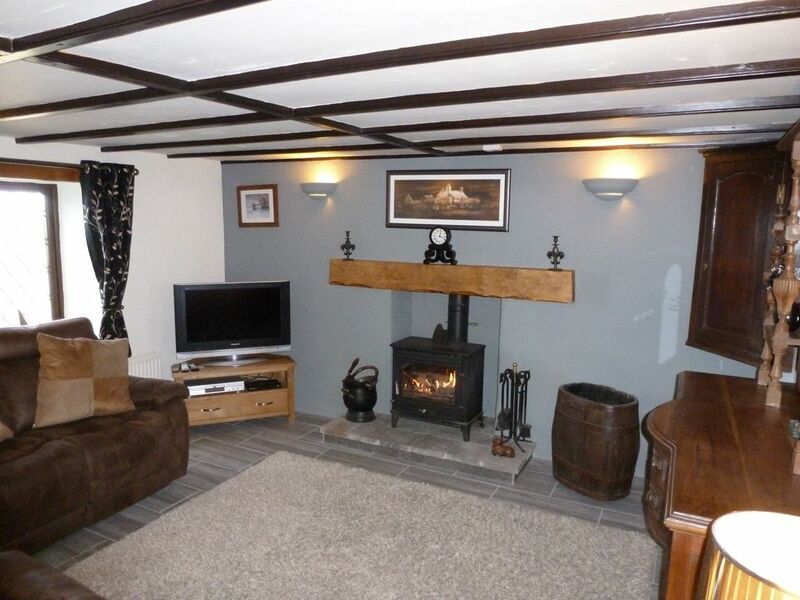 Conveniently situated just 1 mile from the harbour village of Porthgain and the Sloop Inn. Double bedroom, Twin bedroom, Bathroom with overhead electric shower, wash hand basin and W.C. Parking has been altered and made into a double parking area. We moved to Pembrokeshire in 1997 having found this lovely cottage in need of TLC. After doing the renovations we decided to let the cottage as a holiday let so that others could enjoy the peace and tranquility it offers. We did renovations on out buildings that are at the rear of the cottage and made them our permanent home. Bathroom with overhead electric shower, washhand basin and W.C.
Cottage is in a great position and extremely well appointed. Would highly recommend and will stay again. Everything you could need in this lovely lodge owners in adjacent property couldn’t be more helpful if needed. Thank you it was a pleasure to have you stay. Lovely clean, comfortable and well equiped cottage in a beautiful part of Wales. The house is well placed for the lovely Pembrokeshire coast - you can see the sea from the garden. It is in a strikingly quiet location which is great. Inside the house has everything you could want including a dishwasher and adjustable sofa! It feels clean and fresh when you arrive. There was a very nice welcoming pack which is a nice touch. The only slight challenge was the parking beside the house. We would certainly stay again in this lovely place. Treneved lodge is a lovely traditional cottage, it has everything you could possibly need. It is very near to Porthgain which has a couple of excellent places to eat. From the cottage you have lovely views across rolling countryside to the sea. Well appointed cottage in excellent location. Treneved lodge is 6 miles from St Davids and 11 miles from Fishguard. There is a local bus route to both and also a mini bus that takes you along the coast and into the cove around the area. There are beaches (Treathllyfn,Abereiddy,Abercastle,Whiesands,) within walking distance or within a short drive.. There are 3 Pubs (The Sloop, Porthgain, The Ship, Trefin and The Atramont, Croes-goch) all within 1 mile. The local garage is 1.5 miles away and has a well stocked Spar shop. All bookings are Saturday to Saturday. Short Breaks (4 nights) are 75% of full week price and can be taken out of season and within 3 weeks of booking date. After agreeing the booking, a deposit of £100 confirms the booking the balance falling due eight weeks before your arrival. If booking less than eight weeks before the start date of the booking, the full rental falls due. We do not provide cancellation insurance and recommend that if you need this you take it out yourself. If you need to cancel more than eight week from the start date of the booking we will endeavour to let the property to someone else. If this is possible, we will return, at our discretion, as much of the balance as possible, taking into account any additional costs incurred. We ask you to respect the fact that you are staying in a privately owned cottage and that you treat it as you would expect someone to treat your own home. If you break or damage something, please make every effort to replace it or contact us to advise us of the damage. You will be required to replace any item or pay to repair any damage made whilst you are staying at the property. Accommodation is limited to the number of people previously advised even on an overnight basis Arrivals are from 3.00 pm and departures by 10.00 a.m Electricity, Heating,Towels and Linen are included in the rental. No pets are permitted. No smoking in the cottage itself. We also provide an initial supply of toilet rolls, washing up liquid and kitchen roll.